Combine the style, performance and comfort of the Kingpin with enough storage room for a weekend away, and you’ve got the all-new Kingpin Tour. 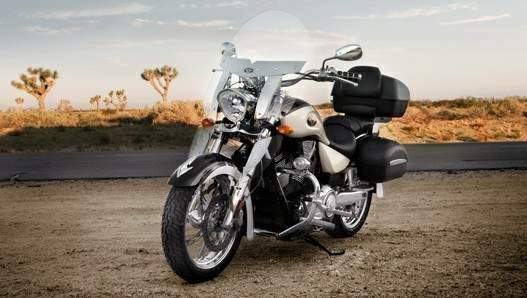 Victory’s own 100 cubic-inch Freedom V-Twin, with six-speed overdrive transmission, makes passing easy. A total luggage capacity of over 22 gallons including a trunk that can hold 20 pounds of gear makes packing even easier. Comfort comes in the form of a luxury-touring seat with backrest, rubber-mounted handlebars and vibration-isolating floorboards. Passenger accommodations include a backrest and full floorboards. So if you’re looking for the perfect bike to take out on a weekend adventure, look no further than the Kingpin Tour.